Progestins are classified according to their structure in C19 and C21 progestagens. The C19 ones are derived from testosterone, the C21 ones from progesterone. C21 progestagens include cyproterone acetate, dydrogesterone, medroxyprogesterone acetate, chlormadinone acetate, megestrol and promegestone. Of these, dydrogesterone is structurally most similar to progesterone. C19 progestagens include norethisterone, (levo)norgestrel, lynestrenol, desogestrel, norgestimate, gestodene and tibolone. 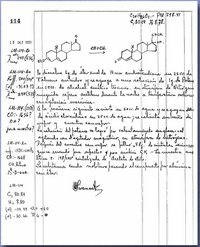 Norethindrone was synthetized for the first time in 1951 by the Mexican chemist Luis E. Miramontes. This substance became the basis for the contraceptive pill.